The Successful Transition and Enhanced Preparation for Undergraduates Program (STEPUP) recognizes talented students and provides them with enriching academic, professional, and personal development experiences that promote success in engineering. Incoming first-year students accepted into the program participate in a rigorous 6-week residential summer (June – July) component that incorporates team building activities, a strong curriculum, industry and faculty speakers, student panels, and corporate tours. 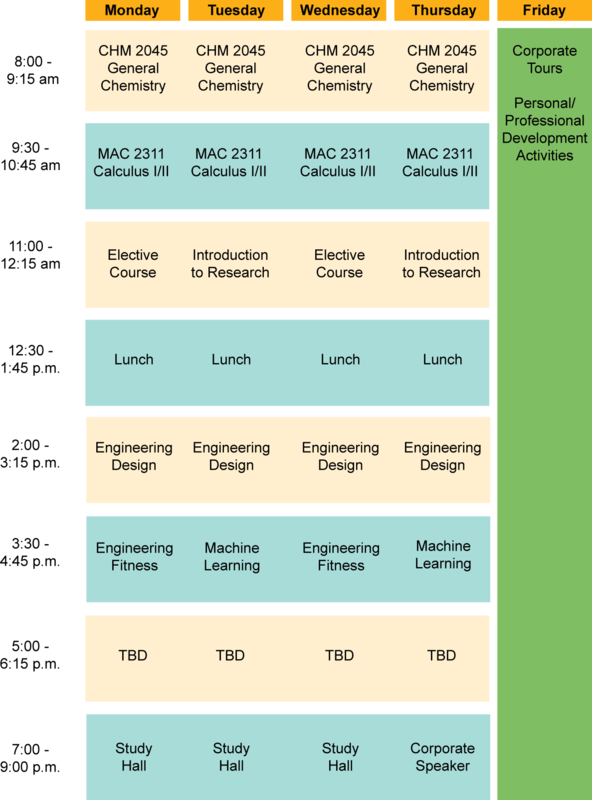 Subsequent Fall and Spring semesters include various activities to promote transition and continuous success of students through involvement in experiential learning (Ralph A. Morgan STEPout component) to include options ranging from study abroad, internships, undergraduate research, community engagement, and design competition teams. Also, support activities include weekly study halls, peer mentoring, corporate speakers and meetings, advisement, feedback sessions, etc. All students in the program become part of a unique cohort of fellow students with peer and faculty mentors. 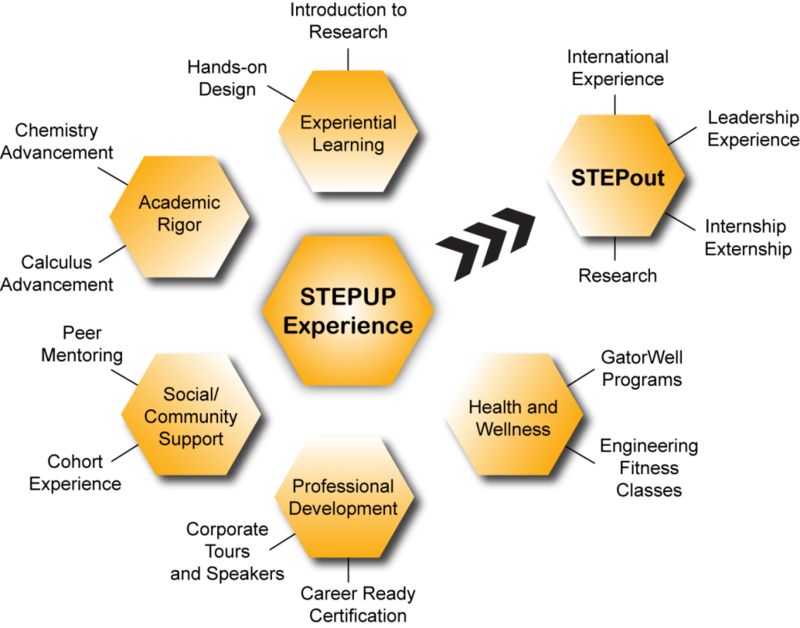 The rigorous activities and shared challenges of STEPUP enable each cohort to develop a commitment to active and informed togetherness as the students progress through their engineering studies – which forms the heart of the STEPUP experience. An accelerated review of the complete first semester syllabus for the CHM 2045 course. Coverage will include: stoichiometry, atomic and molecular structure, states of matter, reaction rates and equilibria, acids and bases. An accelerated review of the complete Calculus I syllabus is undertaken for those freshman who plan to take either of these courses in the Fall semester. Coverage includes introduction to analytic geometry, limits, continuity, differentiation of algebraic and trigonometric functions, introduction to integration, and the fundamental theorem of calculus. Engineering is about solving problems. Techniques for the development and improvement of problem-solving skills are covered in this class. Students will be introduced to CAD software such as SolidWorks. Coverage includes: problem definition, problem interpretation, approach to solving problems, reasons for poor performance in problem-solving, solution of real-world problems, design, construction and performance-testing of an engineering system. Machine learning is a field of computer science that gives computers the ability to learn without being explicitly programmed. This is a field that is in growing high demand among all college graduates. In this course students are provided an introduction to the concepts and techniques of machine learning with hands-on programming assignments using MATLAB/Python. This course provides an overview of conducting state of the art undergraduate research with our Herbert Wertheim College of Engineering faculty. This course offers options to enhance and maintain student health and fitness. Options include strength training sessions that target the major muscle groups using various equipment and body weight. Total body also incorporates bursts of cardio to keep your heart rate up. The “yoga for health” sessions will ease your mind and guide mental clarity toward strength, flexibility and relaxation. Breathing, postures and stress management will serve as the foundation in this centuries-old form of exercise. These sessions are offered through the UF Department of Recreational Sports with nationally certified group fitness instructors and/or trainers. Summer meal plan costs for program participants are covered by the Herbert Wertheim College of Engineering through the support of corporate sponsorships. All Fall/Spring UF Housing and meal plan costs will be covered by the student. Summer tuition and fees for program participants are covered by the Herbert Wertheim College of Engineering through the support of corporate sponsorships. Books – (summer) chemistry book and other classes – free online resources. All Fall/Spring tuition, fees, books, etc., covered by the student. Corporate tour(s) costs for program participants are covered by the Herbert Wertheim College of Engineering through the support of corporate sponsorships. Lunch during corporate tour events are covered by the student. Summer/Fall/Spring miscellaneous activities such as shopping, student planned social gatherings (trip to the movies, etc.) are covered by the student.